The Wing, an eye-catching building designed to echo the shape and uplift of a Spitfire’s wings, features an expansive curved glass viewing platform on the first floor. So, it naturally needed an entrance that would reflect the style of the building and GEZE UK, renowned for its curved automatic sliding door systems, was top of the list. 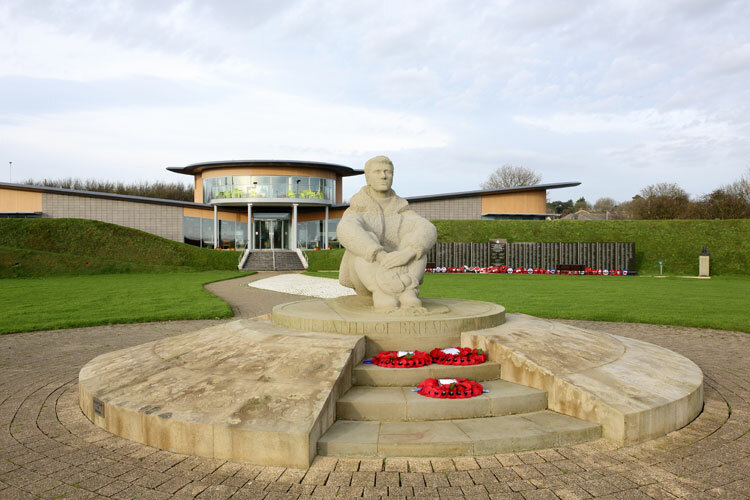 To echo the lines of the viewing platform, GEZE installed two of its popular Slimdrive SCR all-glass circular lobbies to create two impressive entrances to the Wing, which houses a new visitor and education centre for the Battle of Britain Memorial Trust at Capel-le-Ferne in Kent. The first provides access from the car park to the building and the second, directly opposite, provides access to the memorial outside. Situated on top of the white cliffs, between Dover and Folkestone, the award-winning building is truly open to the elements. It was therefore important to choose the right automatic door system because prevailing winds can affect the operation of some doors. Furthermore, the creation of a lobby helps to limit heat loss contributing to a building’s environmental credentials and prevents blasts of hot or cold air which are uncomfortable for staff and visitors. Each circular lobby features two sets of automatic bi-parting curved sliding glass doors to create an accessible, draught-free entrance. The doors are powered by GEZE’s Slimdrive SCR drive which has an operating height of just 7cm, making the installation almost invisible and enhancing the all-glass effect. Installing curved doors can increase the size of the entrance by up to 40 per cent compared to sliding doors, making them ideal for lobbies that experience high levels of footfall. The Wing is home to The Scramble Experience, a hands-on attraction that allows visitors to learn more about what it was like for ‘the Few’ during the summer and early autumn of 1940. It has already received more than 55,000 visitors since it was opened by Her Majesty the Queen accompanied by His Royal Highness The Duke of Edinburgh in March 2015. “The Wing is an eye-catching, high quality building that was designed to make a statement while at the same time respecting its surroundings and not detracting from the Memorial itself. The Trust is delighted with the design, the quality of the building and the reaction from visitors,” said Battle of Britain Memorial Trust, Richard Hunting CBE. Andy Howland, sales director of GEZE UK, said: “It’s often said that a building’s design is unique, but in the case of the Wing, which has been designed to remind visitors of WWII’s most iconic aircraft, the Spitfire, it truly is. “We are always delighted to have the opportunity to work on such high profile projects and the Wing is no exception. The circular lobby created by the Slimdrive SCR, reflects the cockpit-style viewing platform and has been designed to allow the building’s many visitors to enter quickly and easily. The Slimdrive SCR is simple to operate and like all of GEZE’s Slimdrive range, it has been designed and tested to meet the requirements of all relevant standards and regulations, including Building Bulletin 93, Approved Documents B and M. It also assists with the vigorous demands of the Equality Act. The Wing is just the latest in a long line of high profile tourist attractions that GEZE UK has created entrance solutions for. Other projects include the Battle of Bannockburn Visitor Centre, Blenheim Palace and the Theatre Royal Glasgow, to name but a few. For more information about the Battle of Britain Memorial, see www.battleofbritainmemorial.org.